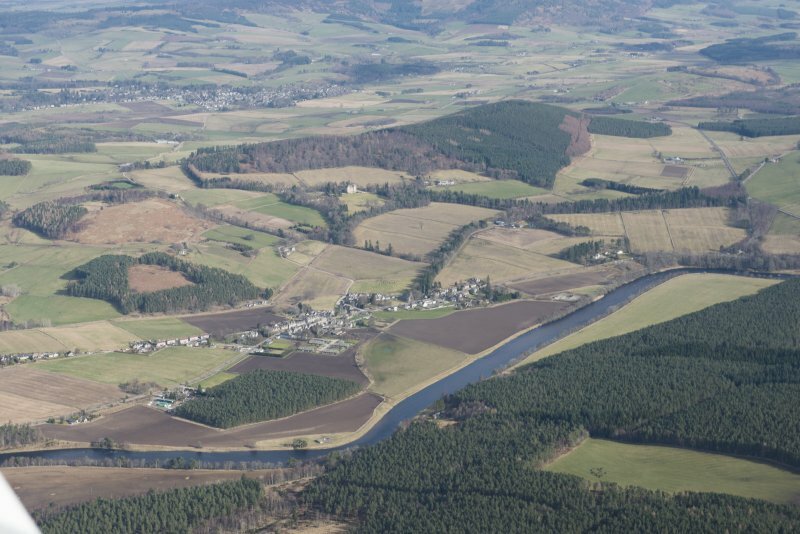 General oblique aerial view of Kincardine O'Neil with Torphins beyond, looking NE. 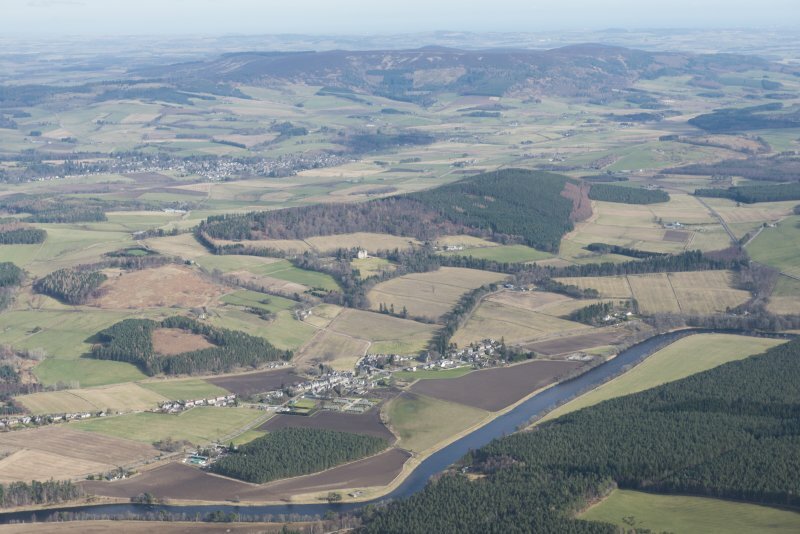 General oblique aerial view of Kincardine O'Neil with Torphins beyond, looking ENE. Scots baronial mansion house designed by Niven and Wigglesworth, London, and built 1897. Asymmetrical 2-storey basement and attic; 4-storey and attic. Harled with rock-faced dressings, bold castellation and early Renaissance detail. Situated on shelf of SW-facing slope at altitude of 170m OD. Stable block to E; SE part perhaps 18th cent, plain harled quadrangle. 2-storey SW front with plaun centre tower, ashlar granite with crenellated top. Air photograph: AAS/98/01/GT, flown 27 January 1998. Dated 1896 replacing an earlier house built about 1780, called Kincardine Lodge. Designed by Niven and Wigglesworth for Mrs Pickering. Their idea of Scottish Baronial and Jacobean architecture, corbelled out turrets, pedimented dormers, large water spouts, all the features of a Mar Castle. Walls tendered with granite dressings. All oak inside. Niven and Wigglesworth's other works in Scotland include the Courier Building, Dundee, 1901-2, and Teith View, Doune, Perthshire 1895. Their decoration of the interior of the steamship Tantallon Castle bears some resemblance to the interior work to Kincardine House. The East Lodge dates from the early 19th century, the stables from c.1840, but principally 1873-4 by James Thomson of Crathes. A scheme for the garden was supplied to Mrs Pickering by Thomas Mawson about 1900. He was introduced to his client by Sir William Cunliffe-Brooks of Glentana, for whom Mawson carried out work at Glentanar, including the new entrance to the Park and the widening of the Bridge of Ess, at Aboyne. It is not known whether the scheme was carried out. Architectural Drawings at Kincardine House. Design for garden lay-out. Ink and colour wash. sqd. (? Jolly or Anon). archt. 25 Union Terrace, Aberdeen. May 1912. Set of elevations of house as executed by Niven & Wigglesworth, 1 March '94. Set of elevations by Niven & Wigglesworth unexecuted. 12 March '94. 9 Barton Street, Westminster, for Mrs Grenville Pickering. Perspective view of Kincardine Deeside, NB by Niven & Wigglesworth. Ink.